What’s up, young readers? As we enter the rainy season, there’s only one talk that runs through every mouth – camping! 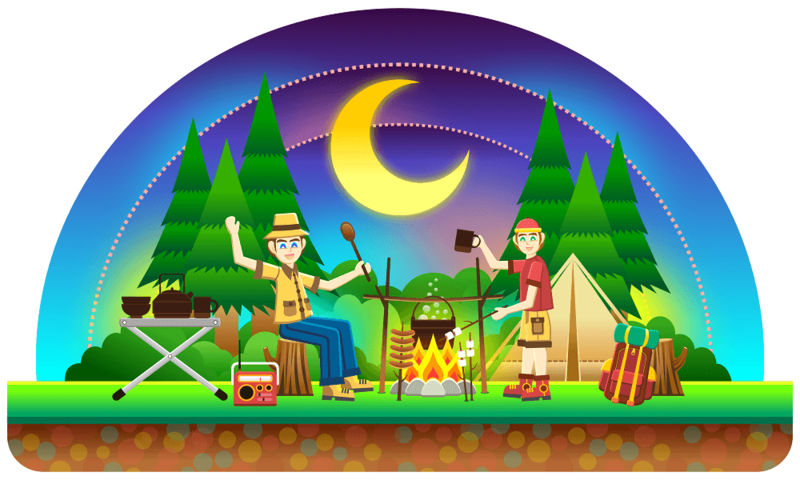 Whether you go camping with your family, friends or a group of completely unknown people, camping is always fun. Not only does camping make your social relations stronger, it also helps you know yourself better! There is no better process of self-exploration than going out there and seeing more of the world and having new adventures. But before you go out camping this time, we thought why not let you have your own visualization of the sort of camp you will prefer. 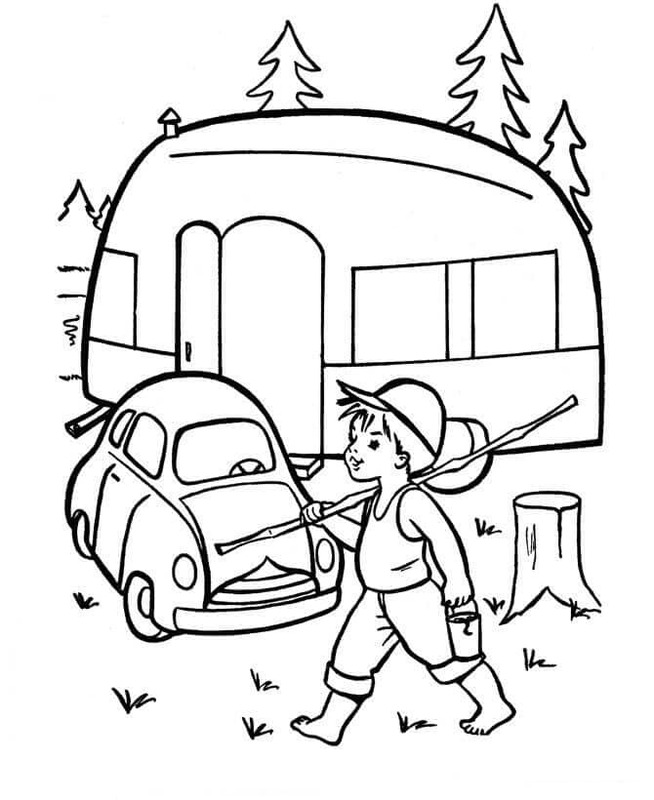 Here are some free printable camping coloring pages that will assist you in the same! 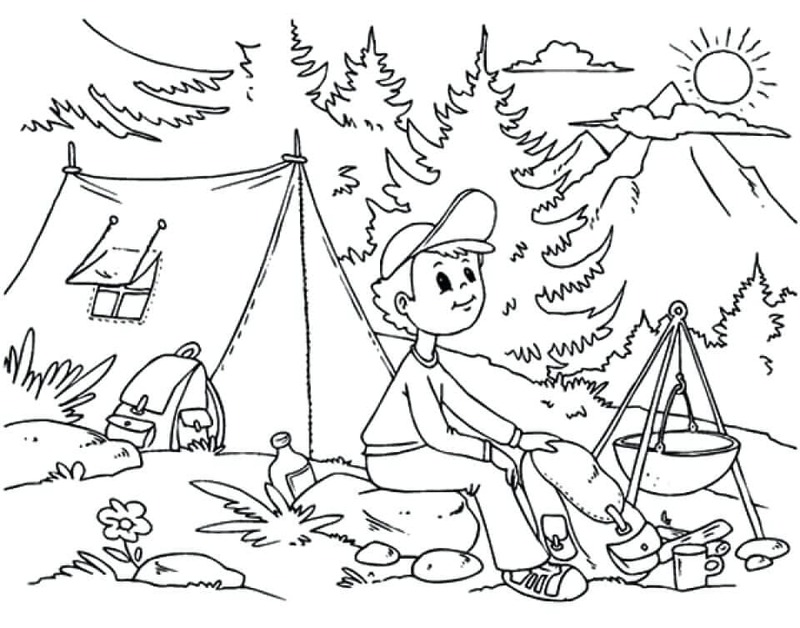 Show your artistic talent to its full power on our free camping coloring sheets to print. Take a look at this image. Mrs. Callister appears to have come out to a riverside camp! Riverside camps are an amazing adventure, mostly because you can fish and cook your own food. Plus, you can go boating! 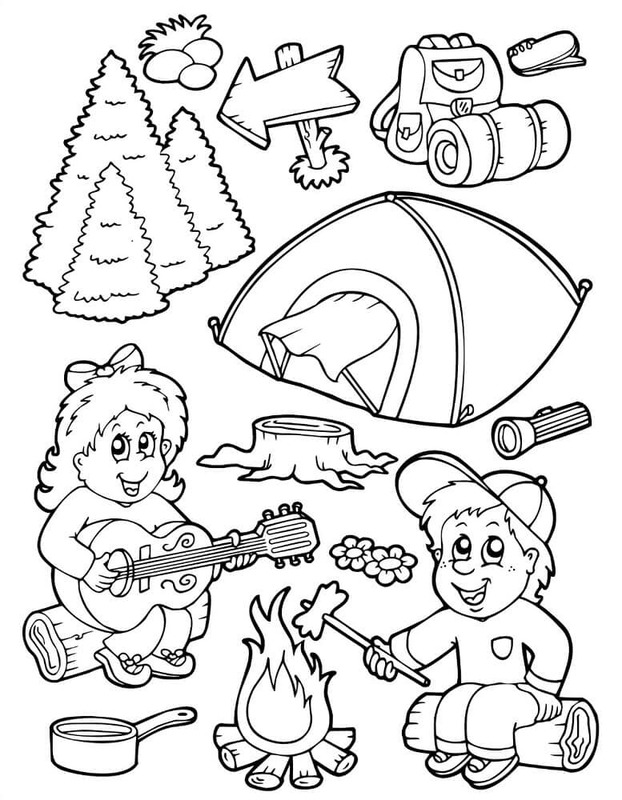 Color this camping site to your taste. Here is Teddy. He just loves camping. He goes out camping a million times in monsoon, and this is just one of the many instances in which he is making tea for his group. In the season of monsoon, a hot tea can warm up your body and make you feel fresher, so Teddy knows exactly what his group needs. Color him cute! One of the most highlighted parts of a camp is the food. While you can go out camping carrying food all the way, many people prefer cooking at the camp itself. 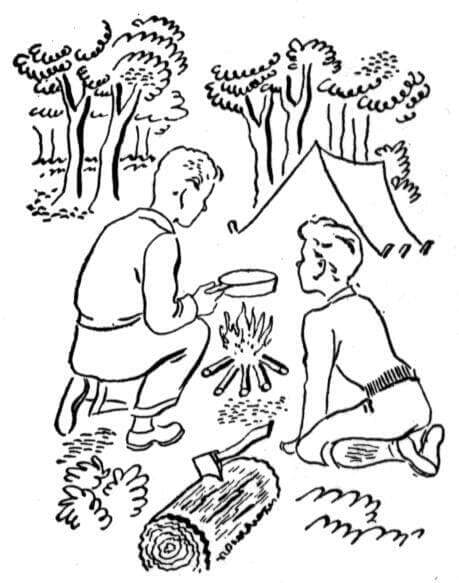 In this image, the boy appears to have barbecued himself some delicious meal using the bonfire. Add some hues to make this setting look remarkable. Apart from the many duties they abide by, the Boy Scouts get to go camping! They go camping at least twice or thrice a year with their group, and what better time than this? It is important for the boy scouts to have a good camping experience, to relieve them from the pressure of their duties temporarily, so they can come back and get to work with productivity! 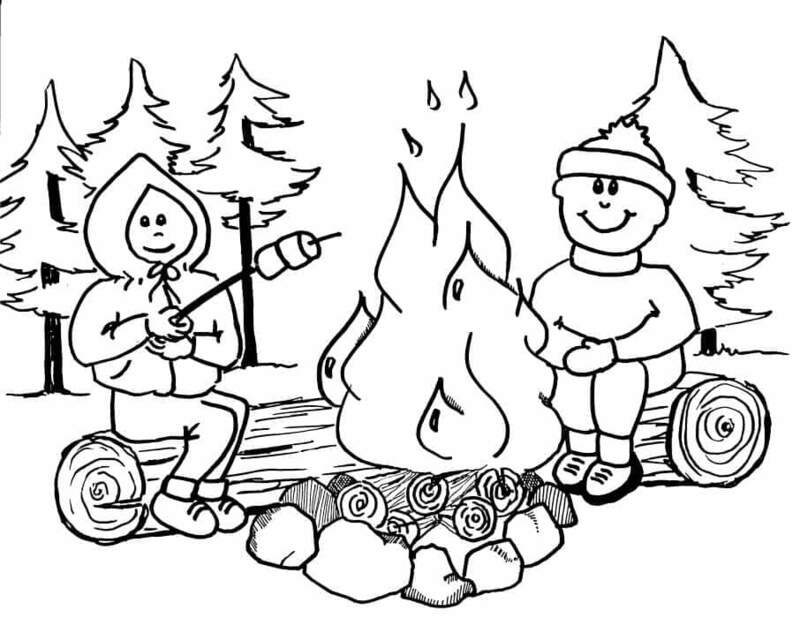 Ensure these boy scouts enjoy their camping by coloring them vibrantly. 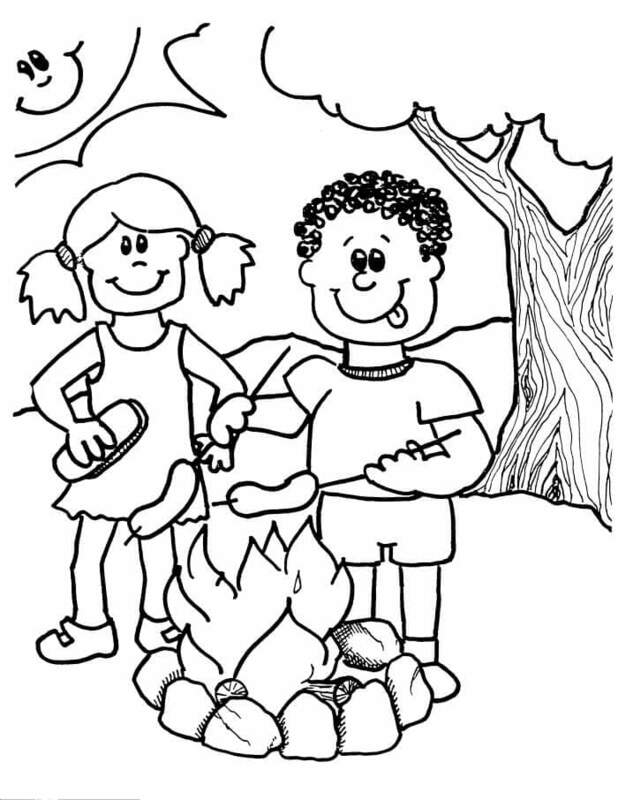 Bonfire has been a signature as the end-of-they-day for humans ever since they lived in forests since today when they go camping. As the sun starts to settle and after a hard day’s work, the evening is made elegant by the simple bonfire which enlightens the hearts of the campers, helps them cook, provides them with light, and also helps keep the creepy-crappy insects away! 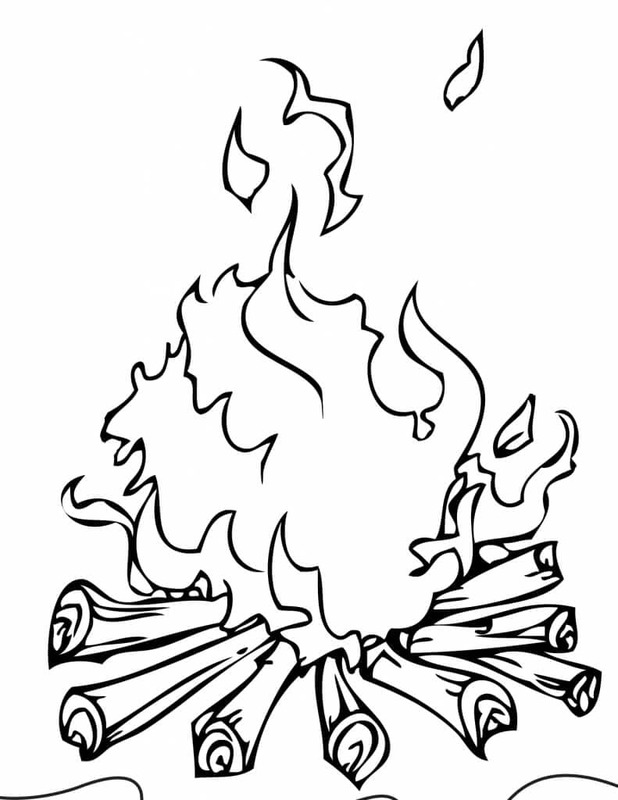 Color the flames of this bonfire hot orange and yellow. Another type of camping is of that in the forest. Between the woods and centered around bushes, birds, and animals, the forest camping is a perfect way to connect with mother nature and get outside the busy and polluted city life. Here is an image of a forest camp. Color it so that it looks natural and appealing! One way of going to a camp is with your family. When you are out there and not in your house, you must work as a team. Camping is not one person’s job! 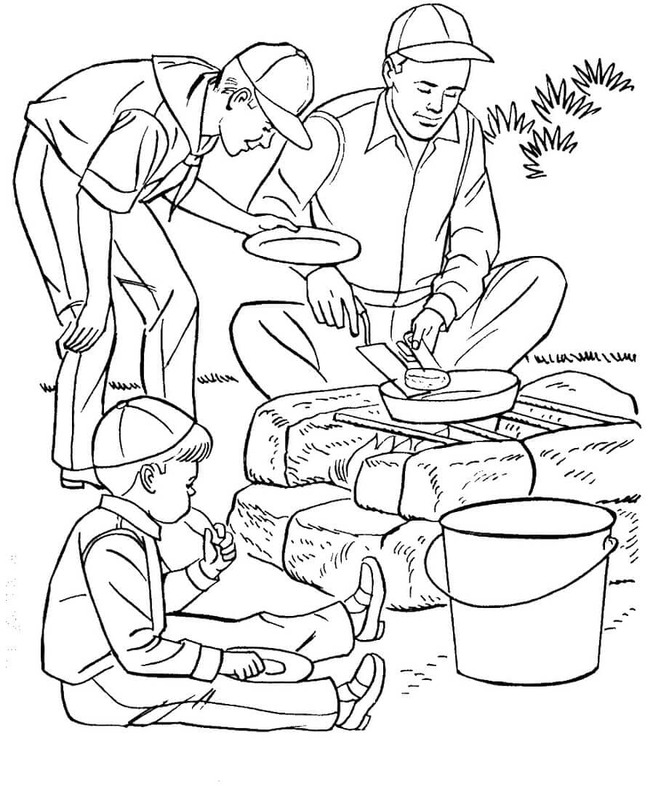 Look at this image where a boy is helping his father cook food and cut wood for the bonfire. Camping helps family tighten their bonds and get a fresh experience that they can set apart as an unforgettable memory. Color the family camp setting with grace. Mountain camping is a different method of camping. In a mountain camp, it is more like a trek. In this type of camping, you have to trek all the way to the top of a large mountain. But this is a tedious job, and ideally, it takes more than a day. To spend the night, people carry tents with them, which they can unfold and relax for the night. Here is Fred, who has had a beautiful night and had just woken up, ready for today’s camping! Look at this chubby little boy. Doesn’t he look so cute cooking himself a sausage out there camping? It is always fun to see people of all ages going to a camp for a new experience together. But there is one thing missing – the color! Use your expert skills and color him up! 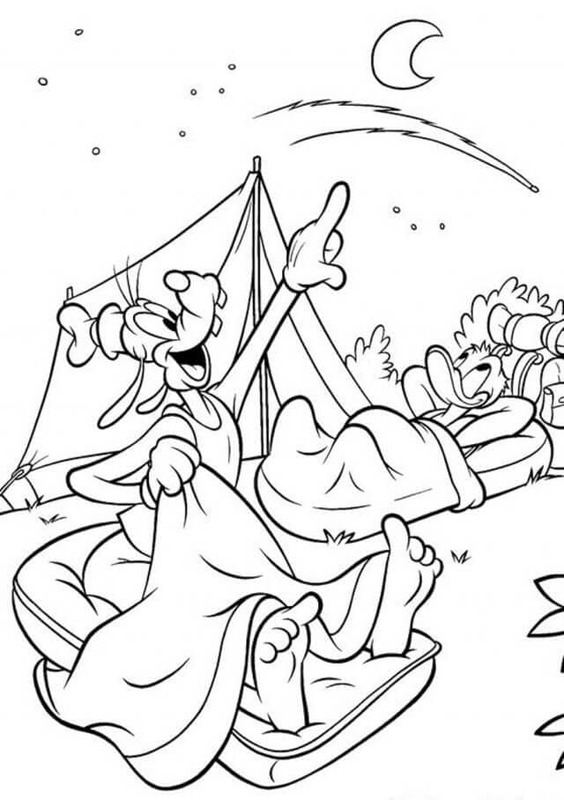 Here is a group of campers enjoying themselves in a tent. They appear to be delighted with their camp so far. 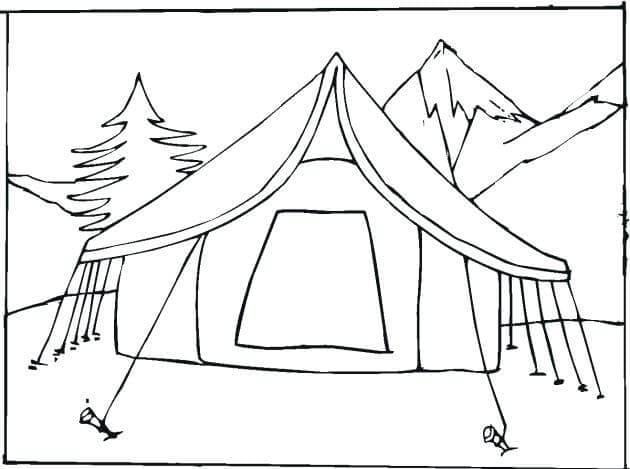 To make their camp even better, color the sky clean blue and the mountains a combination of brown-green to make it perfect. Here is a Mr. Paul trekking over a mountain, with his tent and food tight behind in his bag. Mr. Paul is an expert trekker, as can be seen through his physique and swift movements during the trek. But this time, there is one thing unusual – this trek doesn’t have too much color! Make Mr. Paul’s experience outstanding by adding some hues! While camping always appears to be fun (which it is), sometimes it can show its other sides by popping up a random insect or raining it so hard that your camp goes down! Well, these are just experiences that add to your adventure, rather than make things harder for you. But someone needs to explain that to this running girl in the image! To go camping means you need to be prepared. Here are some camping essentials without which it’s kinda hard to be out there. Color these essentials to perfection (and make sure you don’t forget them)! Here is a tent in the middle of a forest, where the campers are residing for a night. 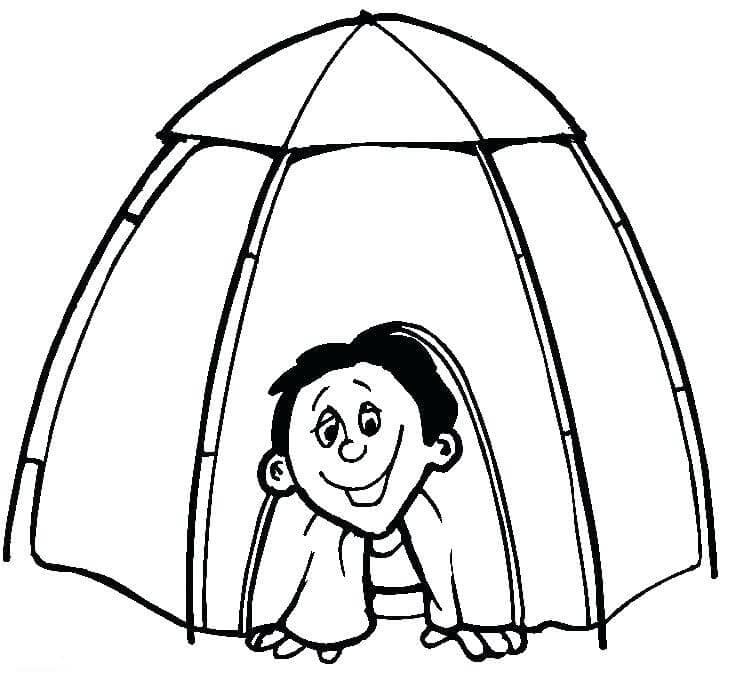 Color this tent green – slightly lighter than the shade of the forest bushes. This will help the campers secure their location from the insects, as it will appear to be just the trees to them! Apart from the monsoon, the season of winter is also a famous time for camping. The snowy, chilly natural landscapes are full of new experiences, so why not yield their unexpectedness to its full? In this image, the boy and the girl are surely enjoying their winter camp. Color them neat. Oh! Look, there’s a bear peeping through the campers’ tent! It is in search of honey, and it does look very hungry. The campers are as shocked as you are! Made this extraordinary scene look more astonishing by giving it some shades! Here are some children making themselves food in their forest camp. They appear to have made a remarkable bonfire with stones all around it. Enhance this splendid setting by using splendid colors! Sometimes, other animals might feel like going to a camp, don’t they? Well, at least I think so. If we can, why can’t they? 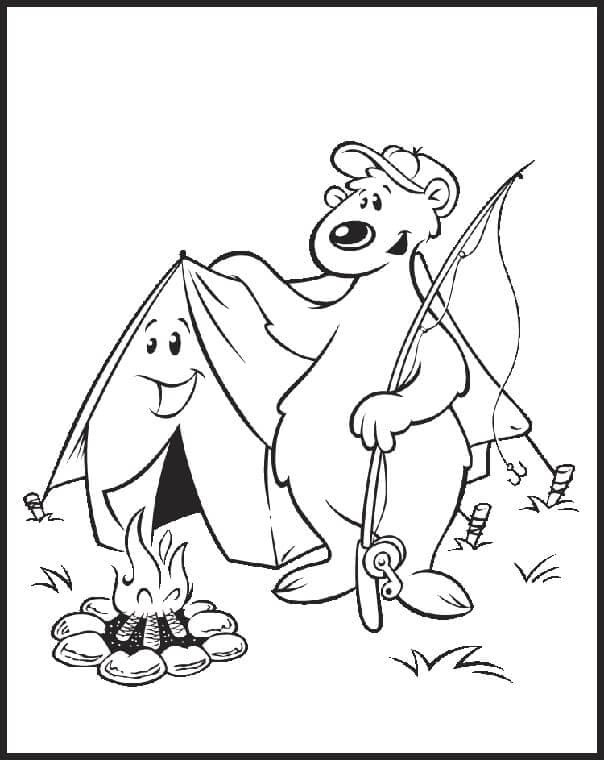 Here is Mr. Bear, with his tent, fishing rod, and a bonfire – all set to catch and cook some fish! Oh, look! Mickey Mouse and Minnie Mouse – the star Disney characters – have come out to camp as well! But the one thing that makes Disney so special is its choice of colors. 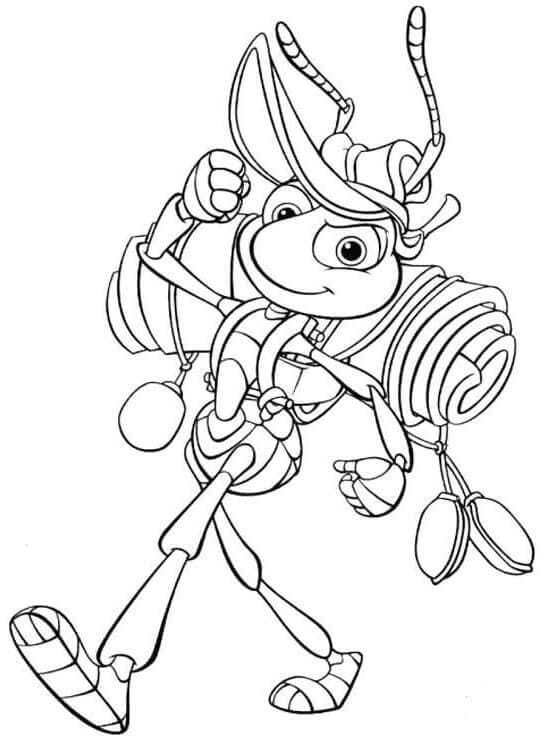 Make these characters look special by adding colors that will shake Disney itself! 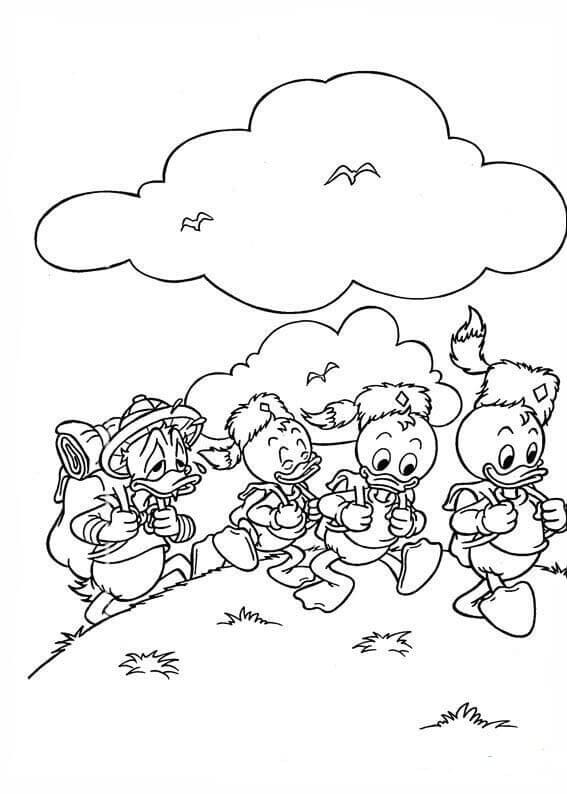 Here is Disney’s Donald Duck out on a hike singing and speaking to herself throughout the way. Donald Duck is a short-tempered, cute, adorable character, who always makes the audience laugh. Make her hike memorable by giving it some color! Here if Flik, the ant. Flik loves exploring new locations and having a fun time with nature. So naturally, his first choice of entertainment is camping. Here he is, set forth to have a beautiful camping experience. Color him super! This is an insightful scene, a tent close to a bonfire in the night, followed by a temporary fence for self-defense. These kinds of images just make me feel as though I should get going, isn’t it? Well, have fun scribbling this one out! 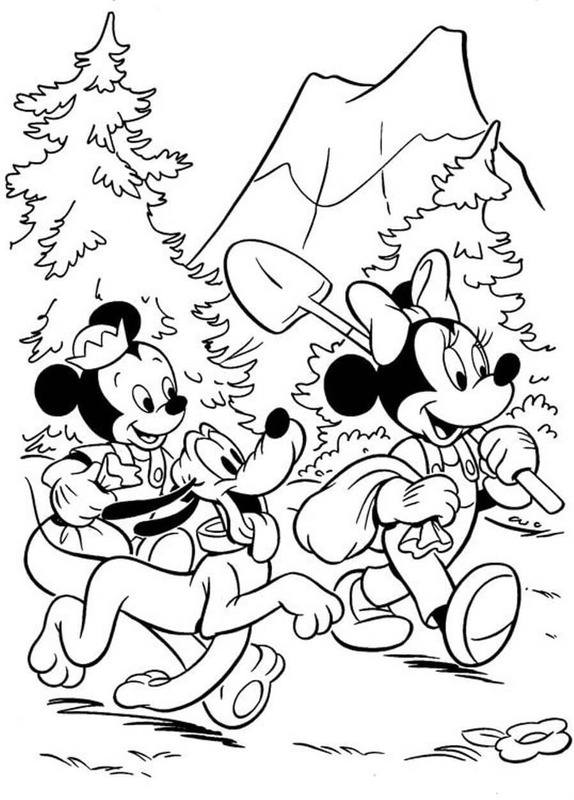 The Disney character Goofy, with his companion Donald Duck, has just spotted a comet in the clear night sky of the forest, where he is camping. Color the tail of the comet a combination of white, blue, red, and silver to make it perfect. 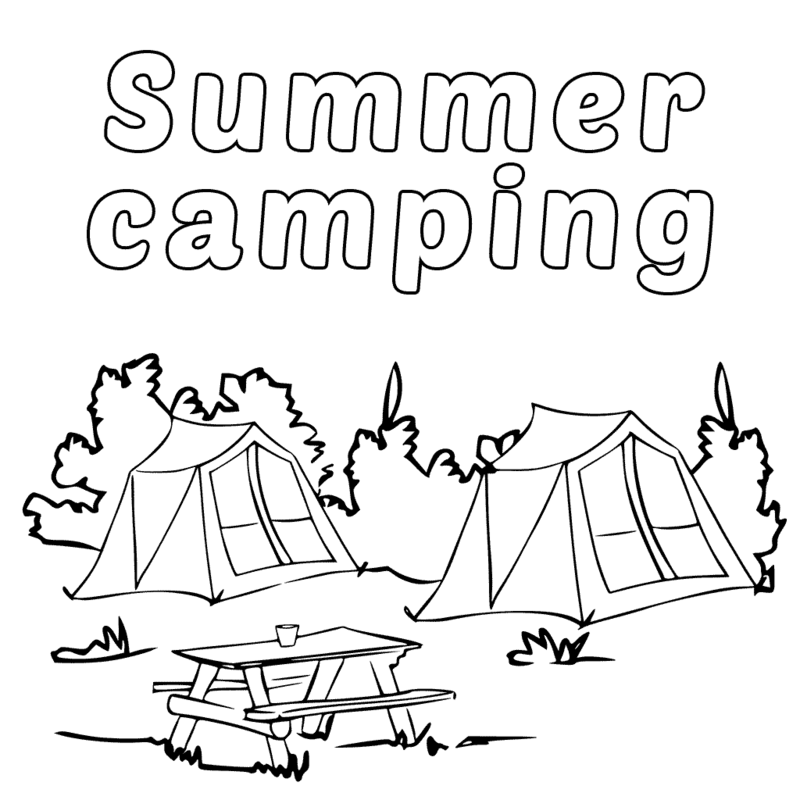 Here is a poster, just for you, which you can print, color, and paste proudly on your cupboard door to show the world your interest in camping! 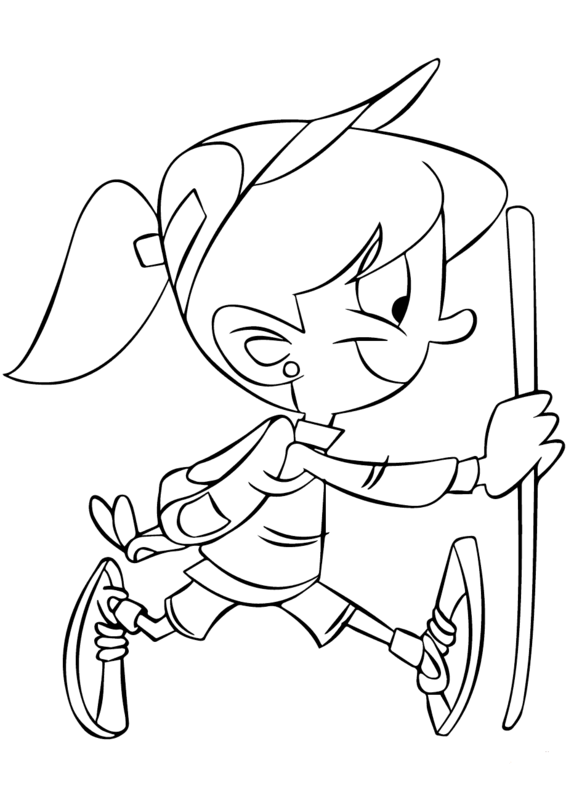 But make sure you color this poster elegantly before pasting it to the door! Look at this humorous image. The cartoon character appears so frightened of the fox, who seems to be troubling him and scaring him. Isn’t this so funny! Make it funnier by coloring it like a cartoon. There is Mona, the famous Girl Scout in her town. She is hardworking and honest. 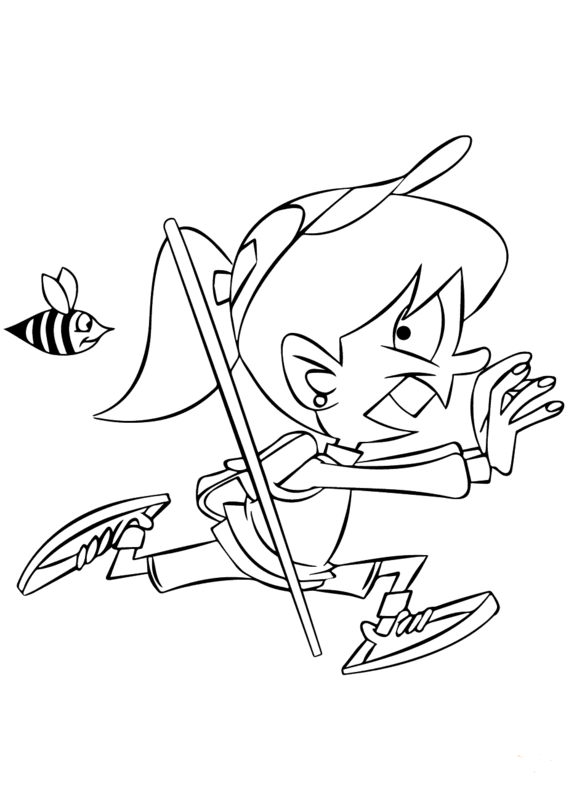 This time, it is her chance to go out camping and relieve herself of the hard work she has done in her town. 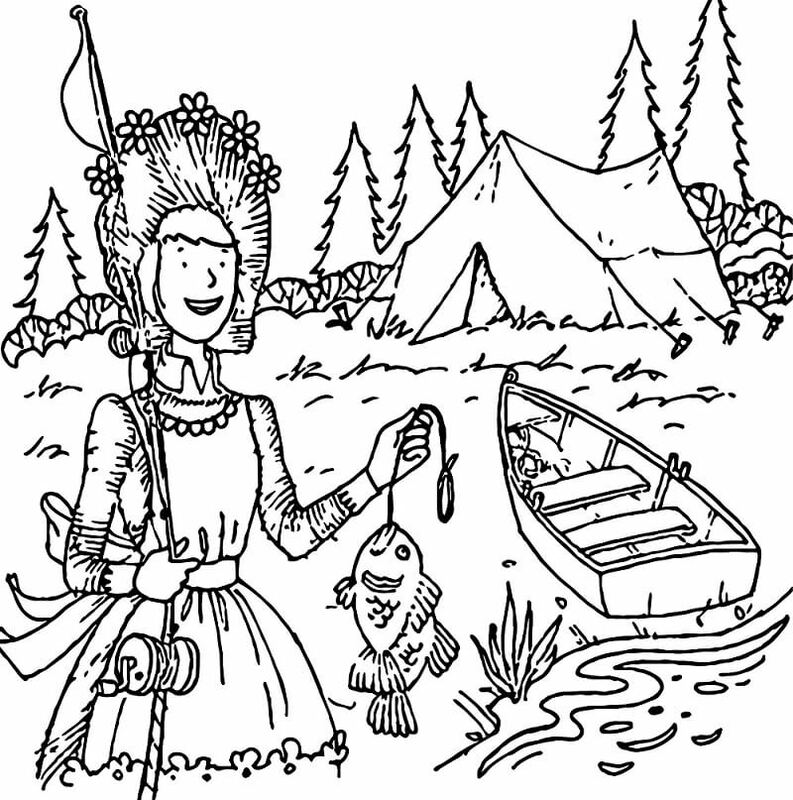 Make sure she gets a good camping time by coloring her pretty. 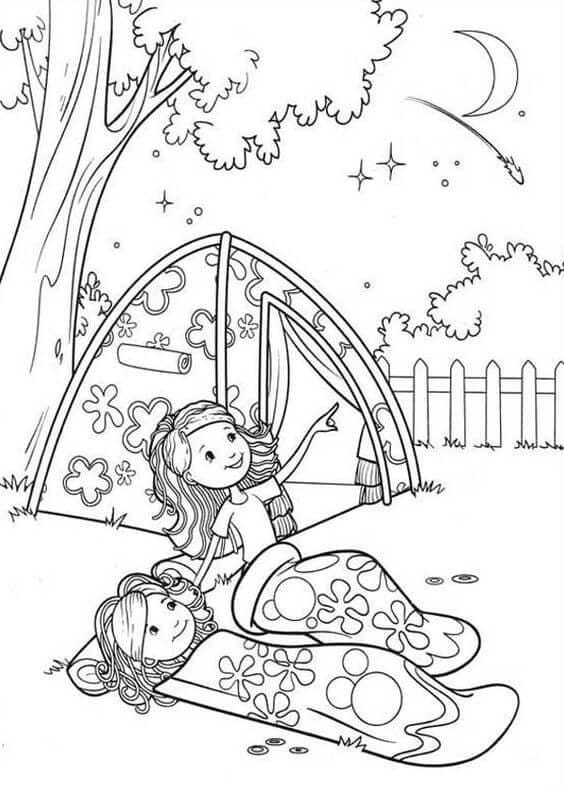 Here is a beautiful camping scene where the girls are star-gazing in the clear night sky. Help them spot the right stars and planets by coloring the stars accurately. Look at this family who has taken upon a camp into the jungle. They also have a pet dog! They seem to be having their dinner before they go to sleep in their tent. Make this scene excellent by coloring it up! Here is the camp rule for this group: “Everyone cooks their own food, whatsoever!” Every camp has some defined sure, which must be abided by all the members. 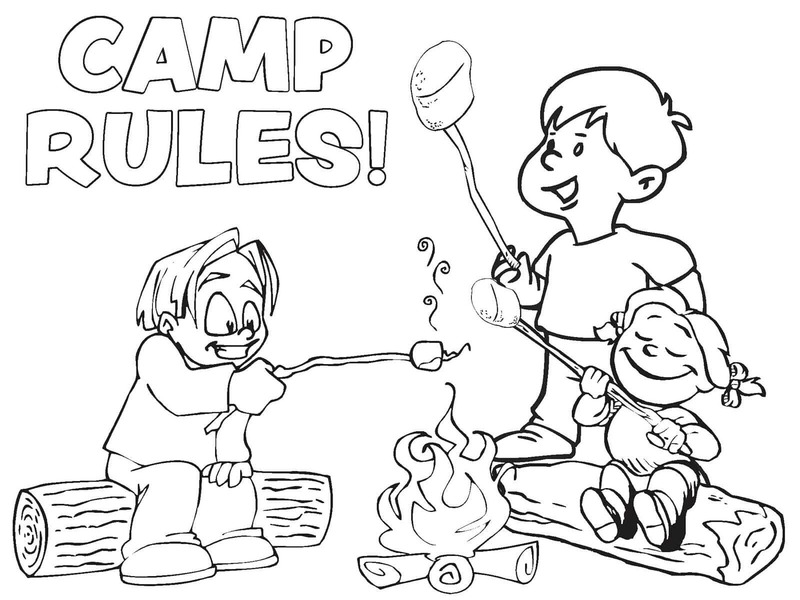 Rules are important, as they ensure the safety of the group members and maintain order throughout the camp. The naughty boy on the left of this image does not seem controllable by mere rules! 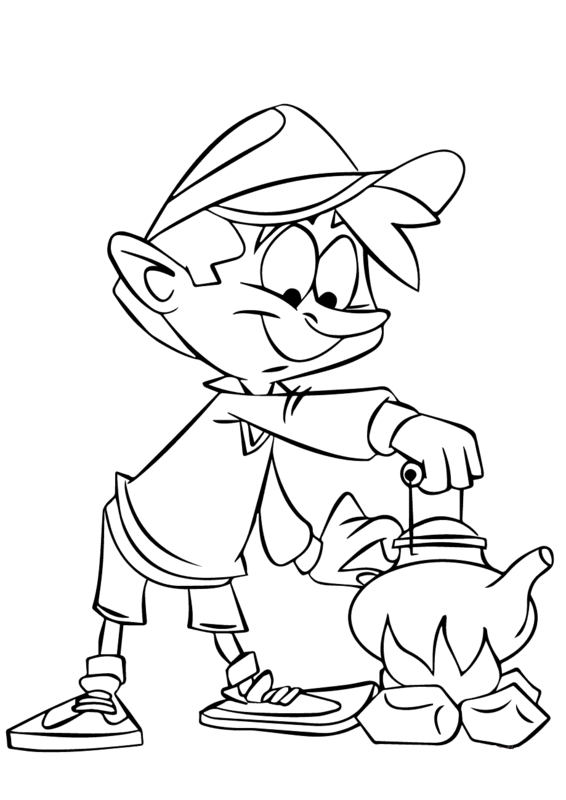 Color him – well – naughty! Who does not like marshmallows, especially the roasting ones? 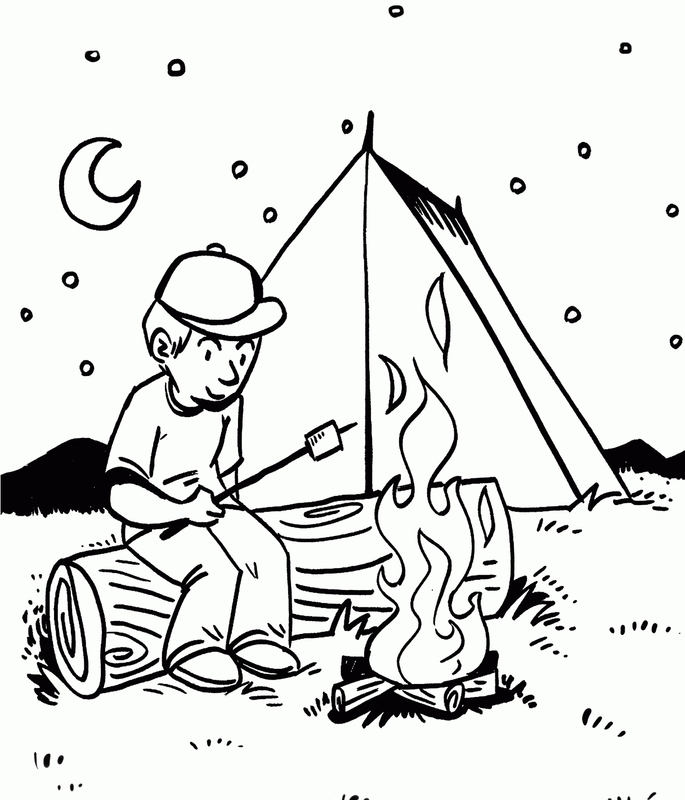 And what better than roasting a marshmallow during a camp in the night time behind a toasty bonfire? 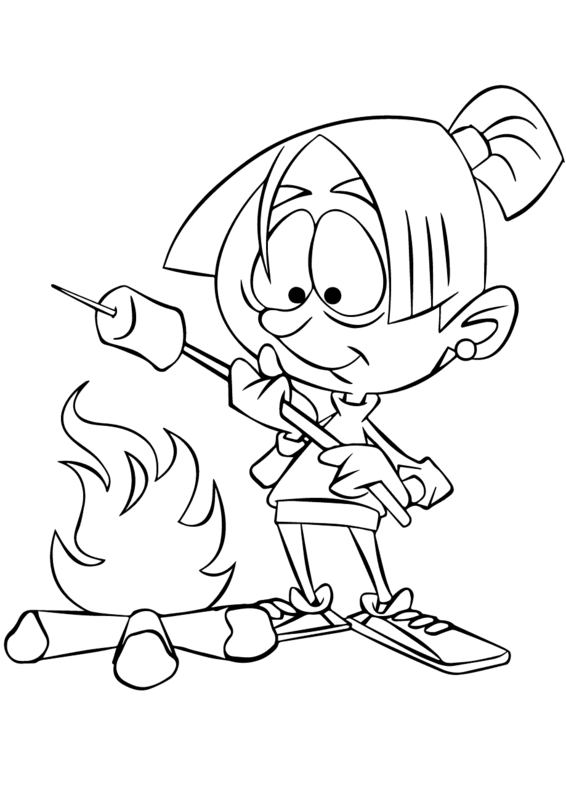 This girl apparently has the same idea, she is roasting herself what appears to be a delicious marshmallow. Color the roasted marshmallow white (and slightly brown over the edges) to make it look lip-smacking! Yet another type of camping is the RV camping. In RV or recreational vehicle camps, people travel to locations such as forest by road and set up a camp there for the night. Look at this image. The family has carried their car into a forest and set up a huge tent over. Color the car sparkly red, the favorite color of the family! RV camps can also be done in caravans rather than through cars. 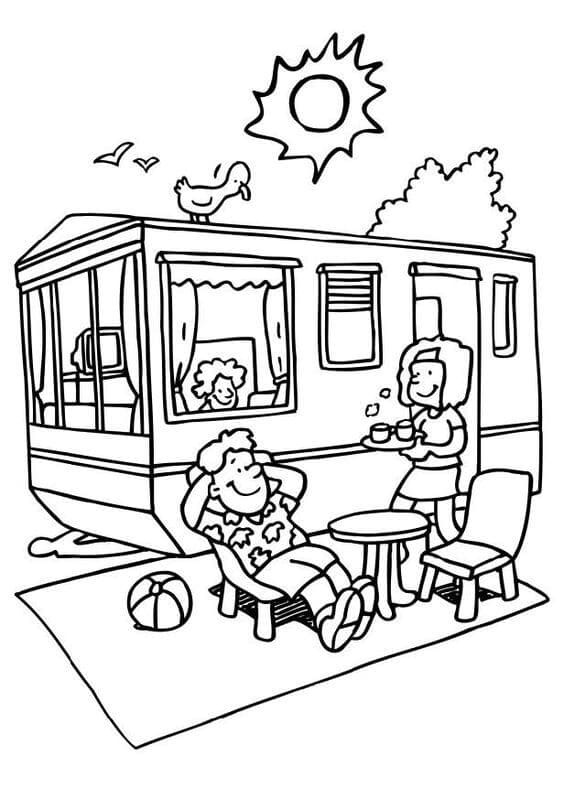 A caravan is a large vehicle which literally has a mini-house towing behind the driver’s seat. This can include a television, sofa, bed, curtains, sometimes even tiny washrooms! What a cool idea to take a caravan into a forest, and spend a night in it over there! Summer camps are a good way of spending the incredibly too much free time which you get in your summer holidays. I mean, who needs so many days at home? Here is a boy tired of being in his house for too long. He has just taken off to a summer camp. Color him endearingly good. 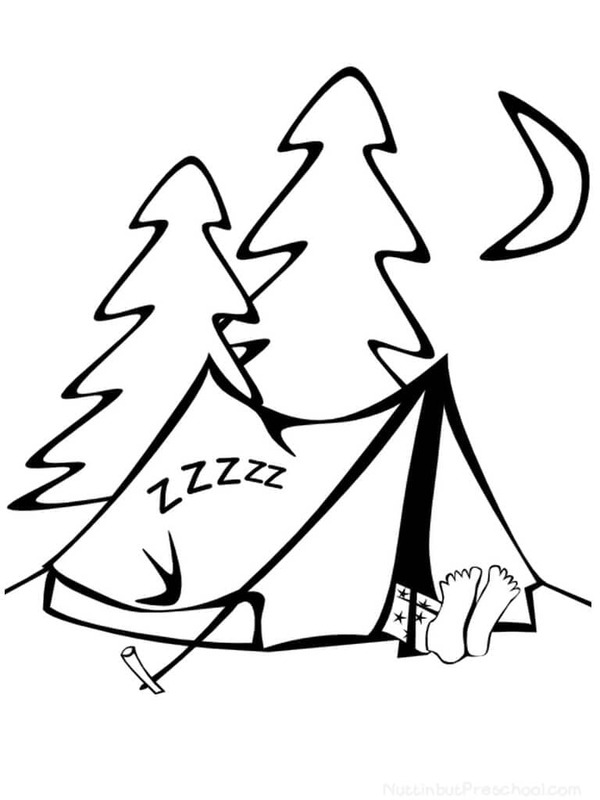 Tents have been the most important component of camping, even since it came into existence. Tents have given a roof to the campers in all sorts of conditions, and they bear all the nature’s harshness while we sleep inside in peace. 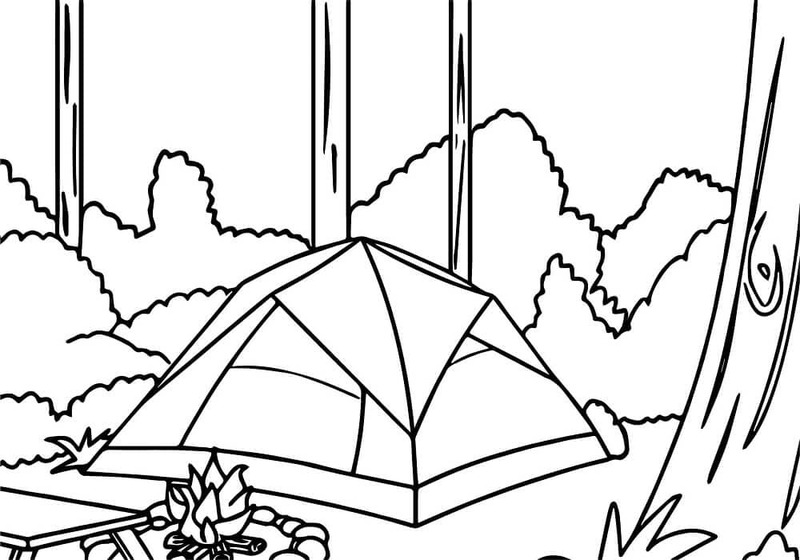 Color this tent attractive. Mike has just made a tiny misjudgment in select a tent, mostly because he cannot fit in it! Look at his feet, they are completely outside the tent! Hmm… that’s not a good thing, because he’s going to wake up finding his legs all muddy and mushy. But you can stop that from happening by coloring his feet clean skin-color without any patches so that he stays out of trouble! 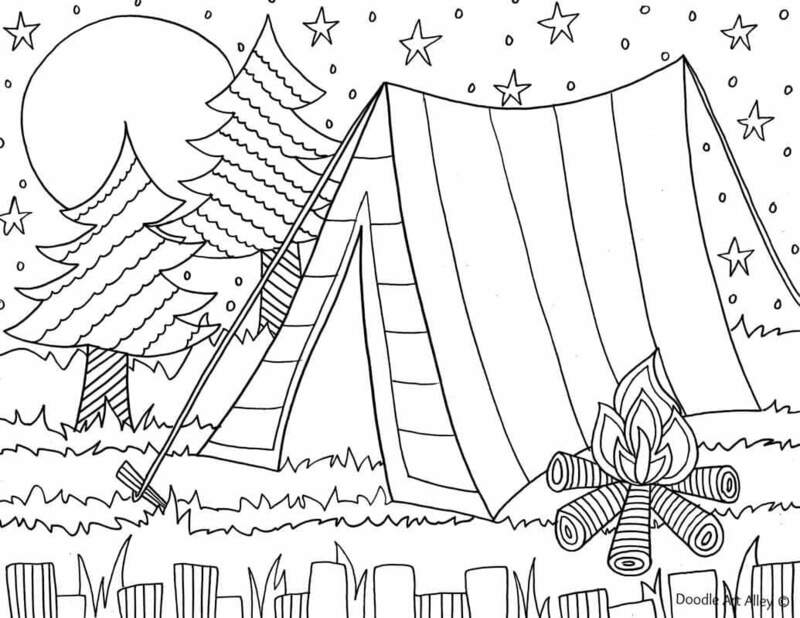 So, friends, did you enjoy our free camping coloring pages printable? Did they appear fun? For me, they sure did! In fact, I feel like running off to some amazing camp right away, don’t you? 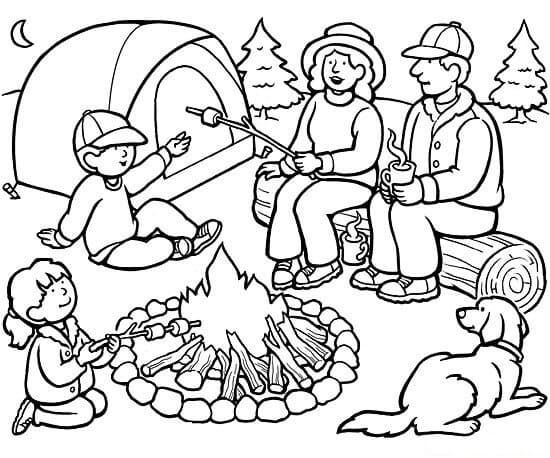 You can share your feelings and your favorite camping coloring sheet from today’s article down in the comments!